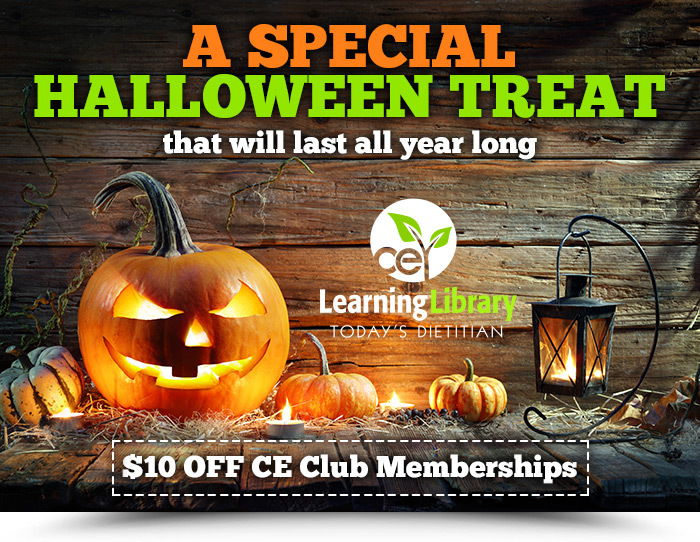 Through MIDNIGHT TONIGHT, SAVE $10 on our CE Club Memberships! Join For Only $40 when you apply coupon code SPOOKY18 to your order. PLUS a year's subscription or renewal to the Today's Dietitian magazine. *CE Club Membership discount excludes books, book exams, multi-part courses, and Becky Dorner Programs. Click here for Membership details. Offer expires on 10/31/18 at 11:59 PM EDT.